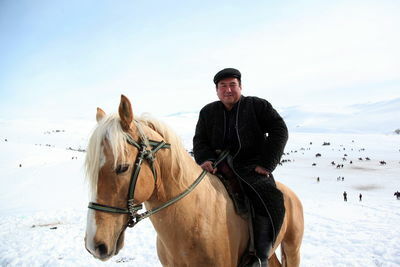 Despite the fact that Uloq should traditionally be played in spring or autumn, horsemen like to play on fresh snow - it's safer when you fall from a horse. 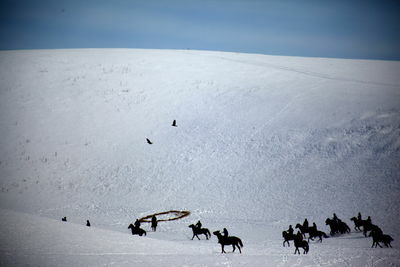 A big round target marks the finish line where the winning rider is supposed to lay the carcass - without getting it stolen from him by other riders with whips clenched in their teeth and horses trained to bite. Spectators enjoy alcoholic beverages while braving the cold to watch the game. 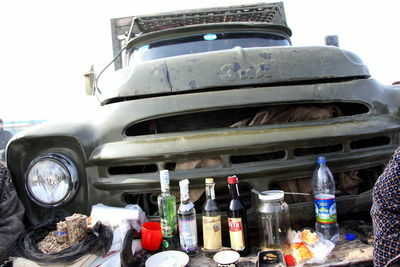 Their drinks of choice: vodka and cheap local wine called "Porto 53." 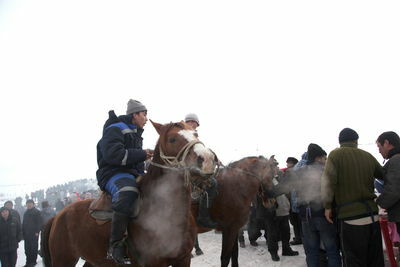 A Uloq rider mounts his horse before the game. 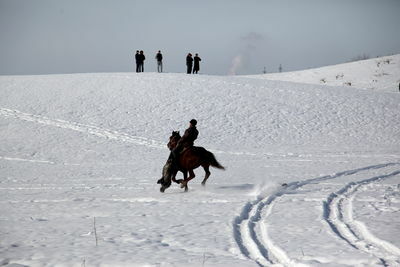 Riders who become too tired to carry on or who are injured can leave the game at any time. 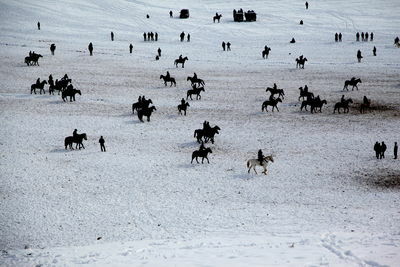 The hoard of riders waits for a signal from the jury that marks the beginning of the game. Uloq fans are often criticized for drinking and bad behavior. 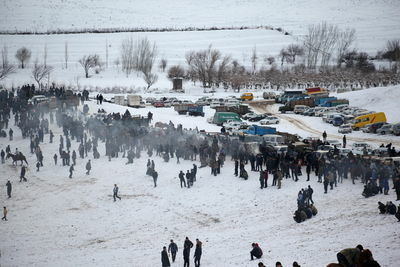 Fans wait in line to enter the massive field where the game will take place in Ertosh. 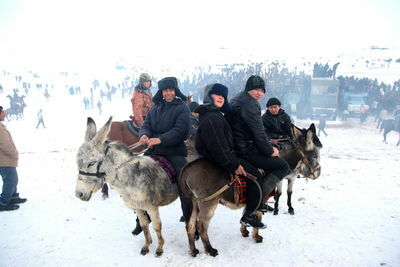 While men ride horses into the game, children and young boys ride donkeys. 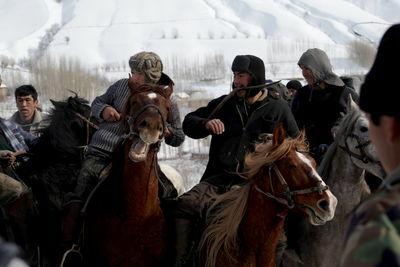 Riders try to wear warm clothes made of thick layers of cotton to prevent injuries from horses and other riders. 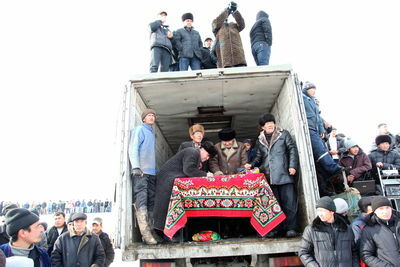 A carcass used for the game should first be beheaded. 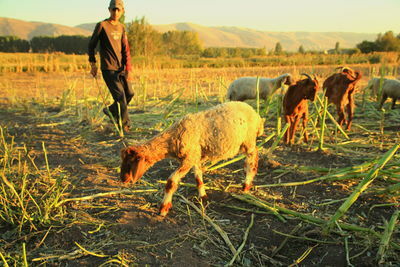 A regulation carcass weighs between 30 and 40 kg. 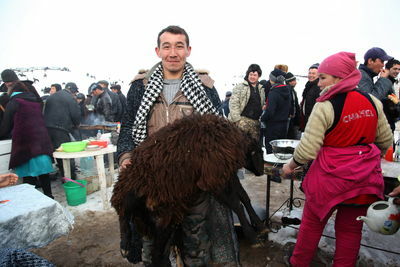 A game of Uloq has just begun before a packed audience in Ertosh, Uzbekistan. 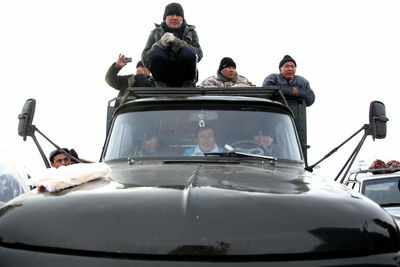 Spectators try to find elevated places to have a good view on the game. Riders are allowed to whip each other. 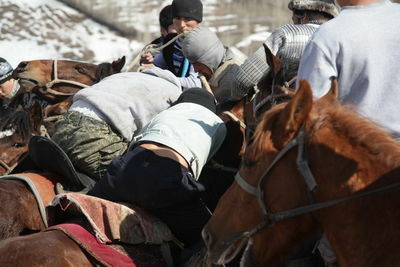 They often hold their whips in their mouths while trying to control their horses with both hands. 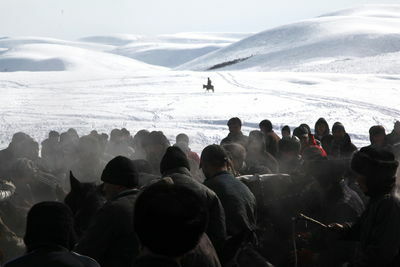 Riders are not allowed to attack each other from the back, but all other kinds of physical attack are permitted. Riders customarily pray before the start of the game. 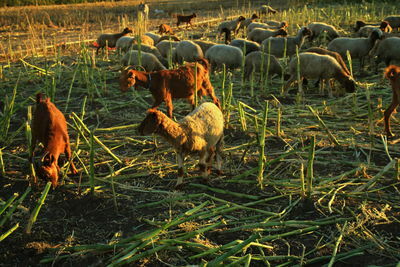 The winner (right) will ride back to the jury with the carcass once he has planted it in the target. 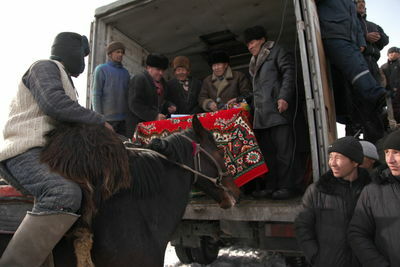 The winner of the game of Uloq rides back towards the jury and spectators with his spoils. 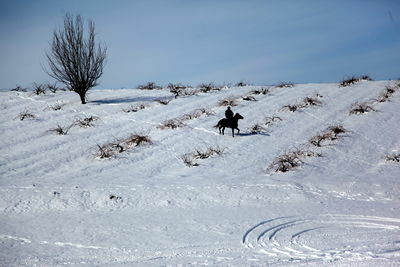 A lone Uloq rider wanders with his horse in the field of battle at the end of the game. 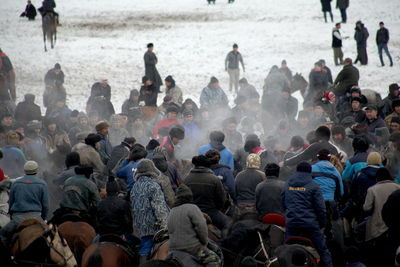 Uloq is the Uzbek version of the famous Asian Buzkashi game. 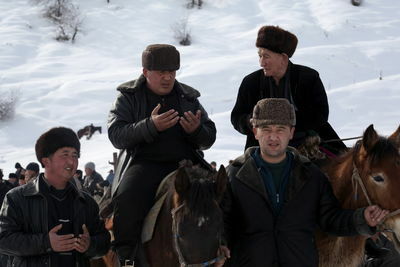 This tradition was spread in Central Asia and Afghanistan by Mongols with their cult of horsemen. 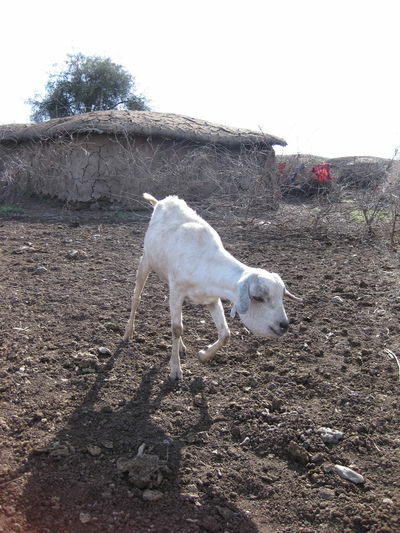 The rules are simple: riders compete for a carcass of a goat or a young ram. 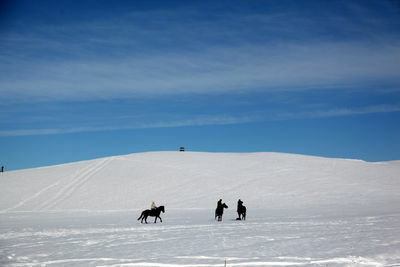 The winner has to cross the finish line on horseback without allowing other riders to rob him of his prey. 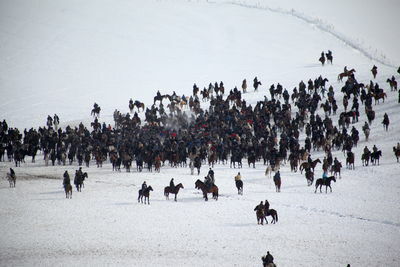 Like Buzkashi, Uloq is an extremely dangerous sport: 100 or more horsemen usually fight for a one carcass. 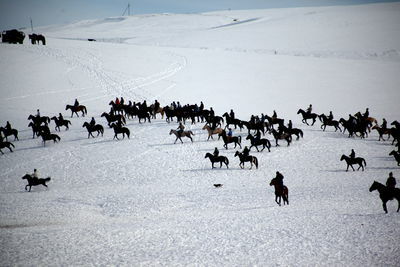 Major Uloq games are usually held in the spring or autumn, when the Central Asian peoples traditionally celebrate their weddings, and is often played before the arrival of their main Spring festival, Nowruz. 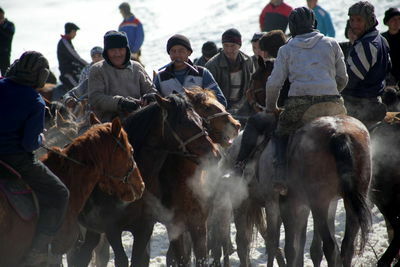 The official Uloq Federation of Uzbekistan conducts frequent tournements and competitions, bringing together up to 500 riders and thousands of spectators to watch the fast, intense sport. 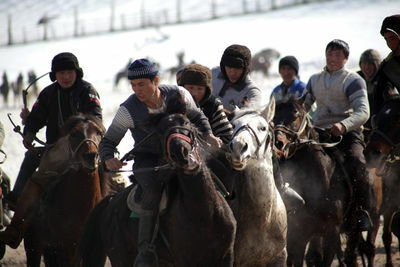 Riders from all the surrounding villages take part in an Uloq competition in Ertosh. Participating in Uloq competitions is considered a good way to demonstrate mens' strength to women. With roof of houses forming the neighbours yard there are numerous places for meeting and the people of Palanagan use it on a daily basis. 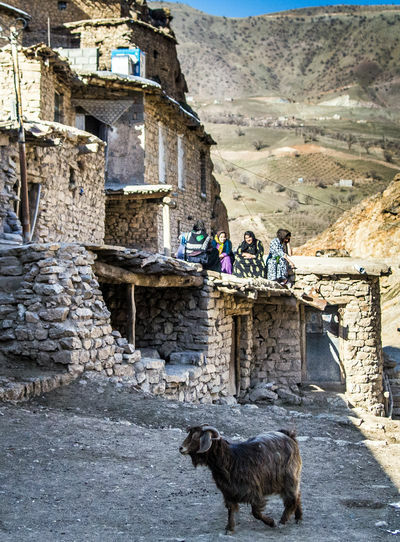 Kurds are closely connected and assist each other in order to survive the harsh life in the mountains. 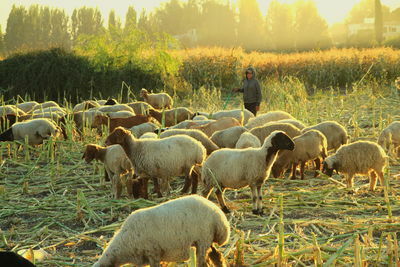 With almost no assistance from the government in Tehran they have to assist each others. 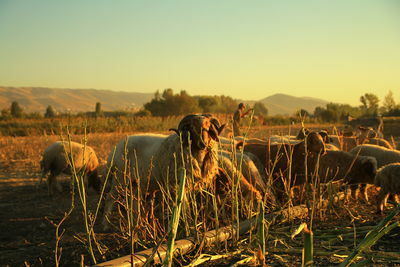 Palangan, Iran. 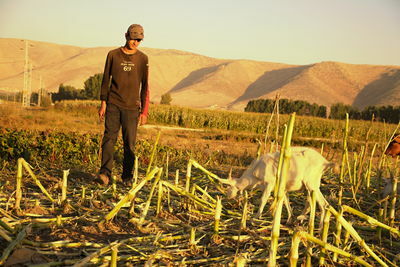 There are a lot of Syrian refugees in Lebanon. 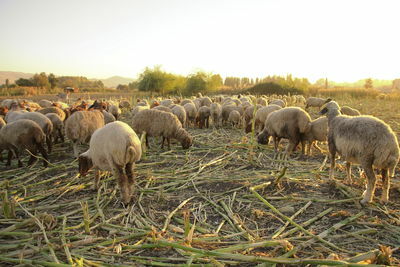 Many of them are poor and live in tents. 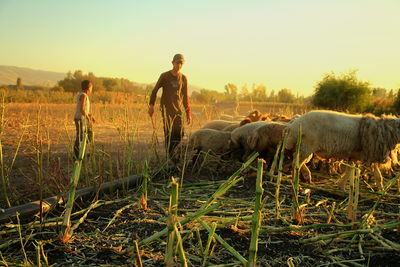 Some children use to work and support their family. 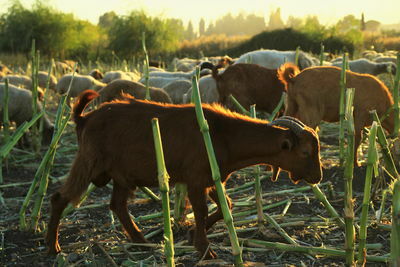 For example they pasture ships and goats. 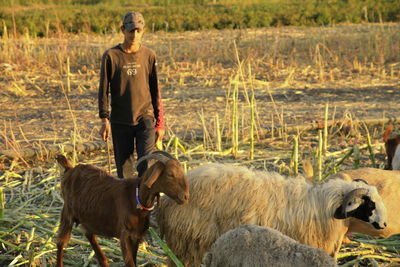 Like these three boys from Quneitra, who live now in Bar Elias in Lebanon. 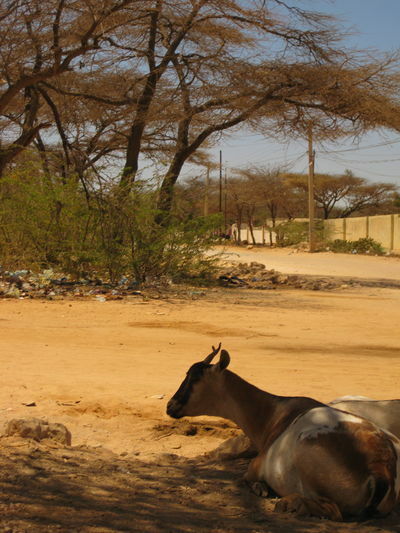 A goat resting in the shade on the side of a road in Hargeisa, Somaliland. 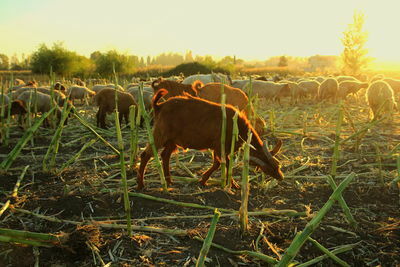 A goats point of view living in a Masai village in Amboseli National Park, Kenya. Archaeologists have discovered 100 or so rock carvings from the Upper Palaeolithic (10,000 to 30,000 years ago) which depict basic animation at 2 to 3 frames per second. 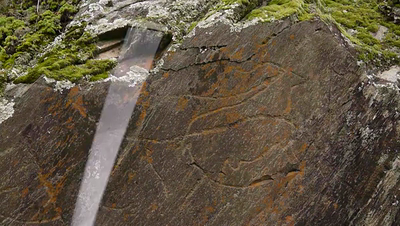 Here one of the figures is traced out by one of the Coa Valley Archaeological Park guides.